SOUTH AFRICA, it's COMPETITION time again!! 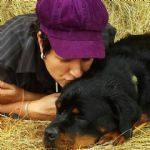 A massive thank you to all the proud Rottie owners who sent in photo's of their 'children'. We are pleased to announce that the Winner goes to the sweetest pair, Alex and Balenciaga and their very proud owner, Linda Lillis! Well done! Submit your best Rottie photo with a description to info@rottierescuesa.co.za, or to this post and you could be featured on our website's Rottie of the Month and Blog Spot :) We will be posting the winner Wednesday 13th July! A big thank you to Smsolutions for sponsoring the sms line for our Coolaroo fundraiser! What do we at Friend of the Rottweiler use for our Black & Tan's all important beauty sleep? Coolaroo of course! © Rottweiler Rescue South Africa 2019. All rights reserved.